This is a 60% hydration dough, for some reason that is , for me, the best hydration to work with. Mixed it all up, gave it 6 S&F every 30 Minutes for a period of 3 hours. Bulk fermentation in the Fridge for 18 hours, let the dough come to room temperature , Shaping, final proofing in Banneton for 2 hours. Baked in a Dutch Oven for 30 Minutes with the Lid on at 250C and a further 20 Minutes with the Lid off at 200C. Family agrees that this is the best SD Bread so far. I've seen a few posts showcasing polenta sourdough breads lately, so here's my take on it. I cooked more porridge than I needed for the dough because it's hard to cook less using my smallest pot. I added 30 g Bob's Red Mill polenta (corn grits) to 120 g boiling water and cooked it over low heat until the water was just absorbed. I let the porridge cool overnight in the refrigerator. 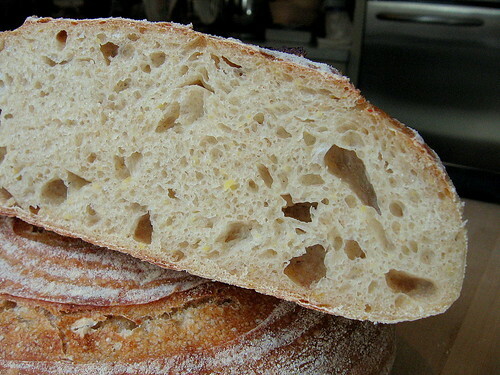 My polenta sourdough formula is loosely based on Hamelman's Vermont sourdough. Overall hydration was 70%. I included the levain in the calculation, but didn't include the cooked polenta. 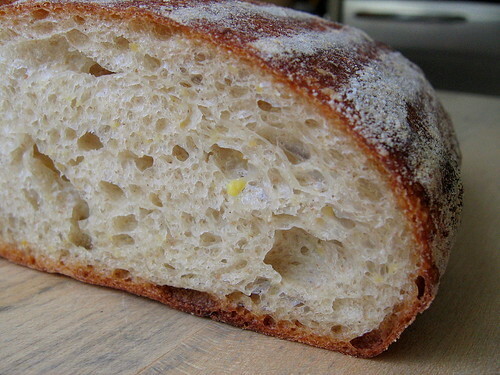 The batard's crumb was definitely better than the boule's crumb. The boule was most likely overproofed, but it still tasted great. Live and learn! When I was in the UK last week, I made David's excellent recipe below. As I have done many times in the past, I prepared the dough and froze half of it to bake later. I hadn't tried this with baguettes, so I was interested in how it would turn out. I froze the dough for four days. On the first batch, I had a heck of a time moving them, as I didn't have all the tools I have in my home kitchen. They got a bit flat as I moved them. 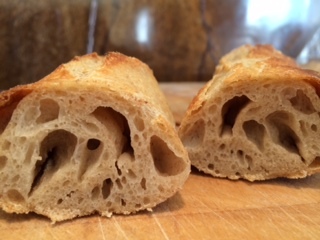 For the second batch, I bought a metal baguette baker with tiny holes that I used for the final proof and baking, and this worked much better for me. I defrosted the dough overnight in the fridge, and it was ready to go the next morning. I followed the recipe instructions from there, placing the new baguette baker on a heated stone. My husband really enjoyed these baguettes, as did our UK friends who tried them. The taste was wonderful and the crumb fine. My husband loved the really crusty crust. Add the salt and mix to incorporate. Transfer to a clean, lightly oiled bowl and cover tightly. Bulk ferment for 3-4 hours with stretch and folds in the bowl every 30 minutes for the first 2 hours, then a stretch and fold on the board after 2.5 hours. The dough should have expanded by about 50% and be full of small bubbles. Divide the dough into 4 equal pieces and pre-shape as logs or round. Cover the pieces and allow them to rest for 60 minutes. Shape as baguettes and proof for 45 minutes, covered. Pre-heat the oven to 500ºF with a baking stone and steaming apparatus in place. Transfer the baguettes to your peel. Turn down the oven to 480ºF. Score the loaves and load them onto your baking stone. Remove the loaves to a cooling rack, and cool for at least 30 minutes before serving. 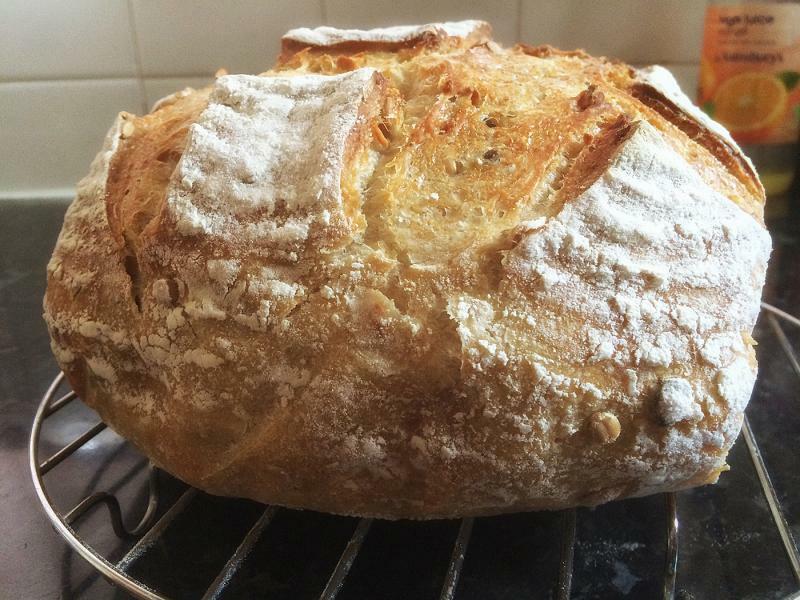 Between wanting a break from my GF experiments and my starter requiring a refresh, it was time to bake something different, something with sourdough. For reasons not entirely clear to me, I keep going back to Leader's Local Breads in spite of its known defects. It probably has something to do with the fact that the breads, when they work, are just so good. Since I had Friday off, one of my morning tasks was to pull the starter out of the refrigerator and give it a good feeding. Thinking that rye flour might be a good pick-me-up for the starter, I used the whole rye flour that I had on hand. At that point, there was no plan for a specific bread, just getting the starter back in fighting trim was the primary goal. Even though the kitchen temperature is in the 75-78F range these days, the starter was a bit sluggish from it's 2-3 week stay in the refrigerator. It was midafternoon before the starter showed real evidence of activity and late in the evening before it was ready to launch a levain. By then, it had more than doubled (with rye flour, remember) and was eager for more food. Since there was only finely milled whole rye flour on hand instead of the white rye that Leader calls for, that was what went into the levain build. After a thorough mixing of the starter, water, and rye flour, the levain was covered and left to its own devices through the night. It was about 7:45 Saturday morning when I walked into the kitchen and found a levain that was ready for bread. All that was left was to combine the levain, water, bread flour, and salt into the final dough and give it a good knead. About 15-18 minutes of kneading, according to Leader. So I set to with vigor, using the slap and fold method because of the dough's relative softness. There were a couple of intervals where I used the traditional push-turn-fold method of kneading but I found myself adding more flour than I wished to because of the dough's stickiness, so then it was back to the slap and fold method. Per Leader's directions, the dough was set to ferment until it had expanded about 1.5 times its original volume. I suspect mine was somewhat closer to doubled but without any adverse effects. The dough was then shaped into a single round and placed in a floured banneton for the final fermentation. 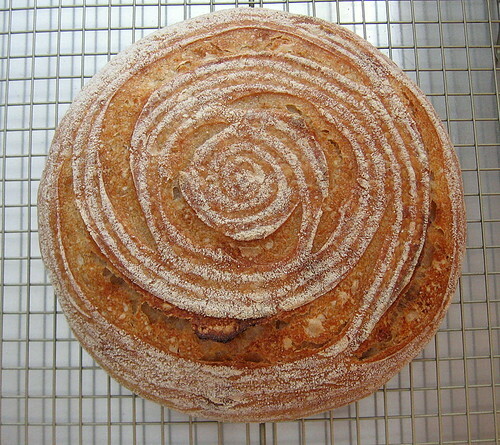 While the loaf was fermenting, the oven was set up with a baking stone and a steam pan. When the loaf was nearly doubled, the oven was switched on. After it had preheated to 450F, boiling water was poured into the steam pan. The loaf was immediately tipped out onto parchment paper, slashed, and slid onto the baking stone. The loaf looked well proofed before going into the oven. Once there, though, it experienced even more expansion; perhaps less than doubling but certainly a 1.5 expansion from the pre-bake size. The fragrance while baking was wonderful. 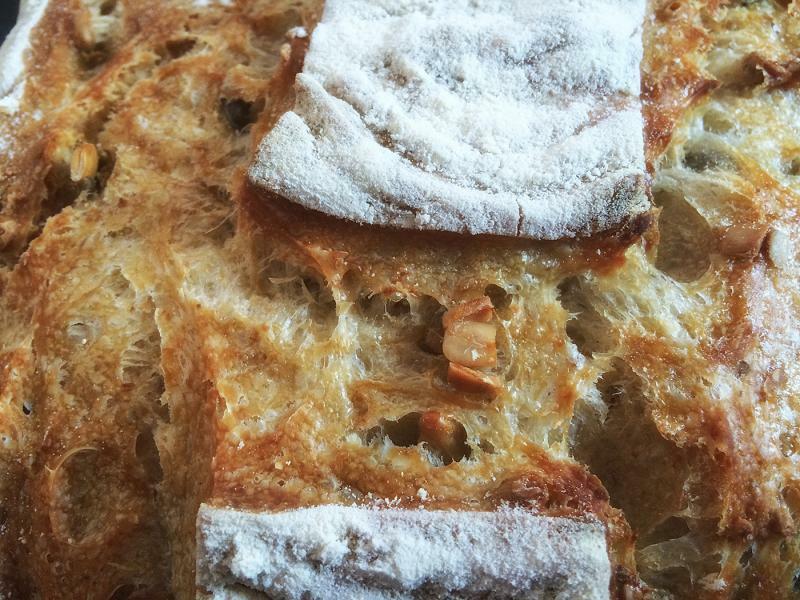 Lots of roasty/toasty notes with sourdough highlights. The deep chestnut tone of the crust is just as appealing to the tongue as it is to the eye; lots and lots of malty and nutty flavors. 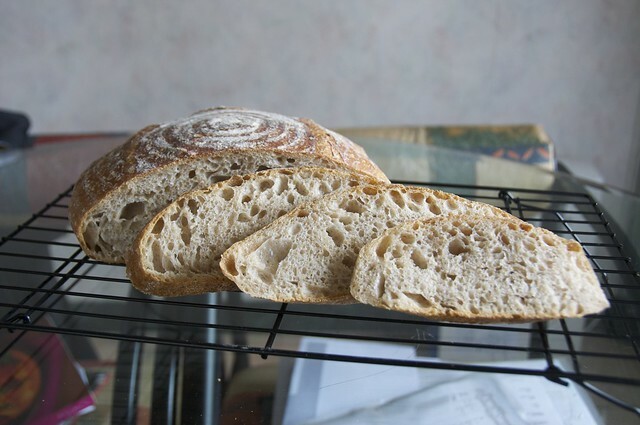 Some of the crumb texture may also be attributable to the use of whole rye, rather than white rye, flour. Since I made no adjustments in the formula's hydration, the perceived hydration may be lower than it would otherwise be. This is a very satisfying medium rye, at least in this incarnation with whole rye flour. 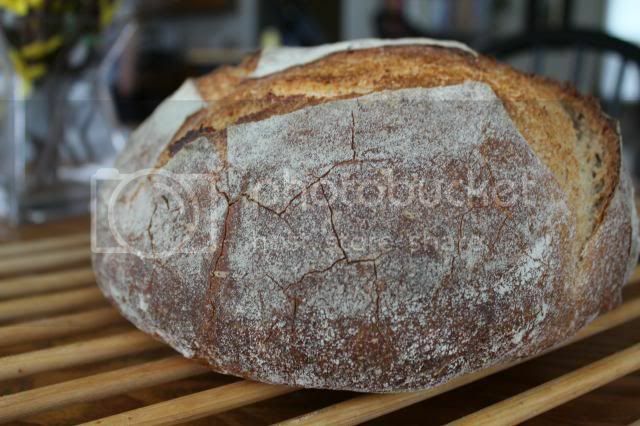 With white rye flour, it would no doubt be an equally satisfying light rye bread. 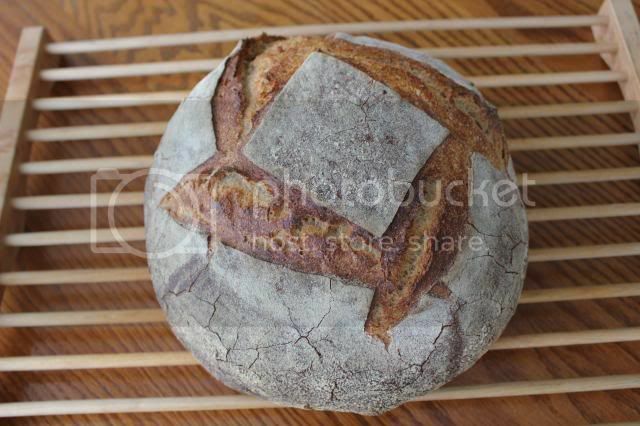 The flavor is a delightful combination of rye and wheat, with the additional richness of the sourdough flavors. Neither seeds nor bread spice are needed in this bread; it is complete as is. If you have, or can obtain, a copy of Local Breads, I heartily commend this bread to you. Mixed all ingredient except salt. Add salt with Pincer method till it reaches medium gluten development. About 4 squeezes alternate with 10 folds. Pre-shaped, rest 20mins and shaped. Over-night proof in the fridge for 9 hours. Bake right out of oven in a dutch oven at 240C covered for 20mins, 20mins uncovered. This bread is really tasty, one of the best I ever had. I can barely stopped myself from finishing the loaf after having 4 slices plain. Evilish bread. Using a Leaven made with 15g Rye Starter and 25g each water and flour. Once it was nice a bubbly I added 9g Dry Instant Yeast, 250g bread flour, 250g rye flour, 8g salt, 1 tsp sugar, 1tsp caraway seeds and 3Tbsp vegetable oil. To this I added 350g warm water. Mixed it all up, let it rest for 30 minutes and gave it 20 minutes quality kneading. It doubled in size beautiful and and it looked airy. I formed in to a boule and put in to a floured banneton. The dutch oven is pre heating to 250C as I type. I shall turn out the dough on to parchment paper, score it, put it with the parchment paper in the Dutch Oven. The bread will bake for 30 Minutes with the lid on at 250C , then i reduce the temperature to 200C and bake for another 15 minutes. I shall let you know how it went. 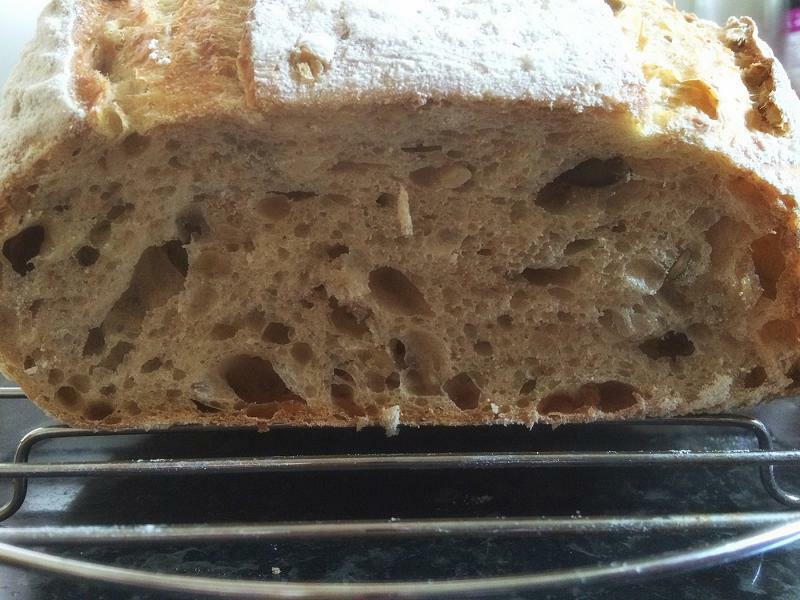 The recipe is from a German Baker, though he uses fresh yeast which I did not have at hand. Bread came out of the Oven and looks beautiful. I will order some fresh yeast next week and see if that gives the bread a little more rise though I really do not mind, it looks good enough to eat to me. The subtle smell of the caraway seeds is amazing. My Dad would have loved this bread. I received a pound of greenkorn (the unripe wheat). Has anybody ever baked with this? 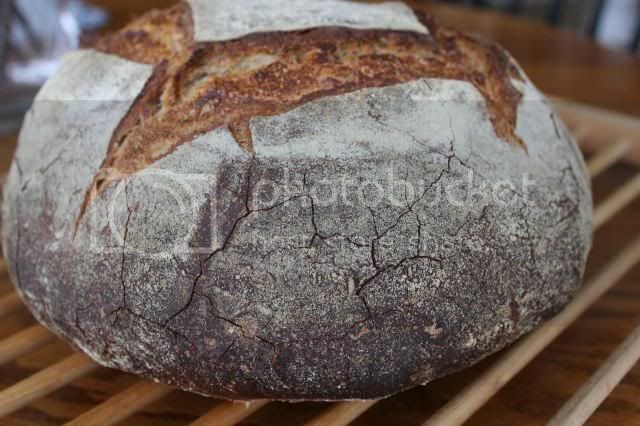 I would like to try a sourdough bread seeing that I still have a lot of starter left. Plans to start a bakery; what next? The thoughts and plans of starting a bakery in Dubai have been broiling in my mind for over a year now. As many of you already know, I began taking pastry classes some few months back as I believe that knowing how to make bread alone just won’t cut it. So, I took the classes and collected my certificate and now I think that the natural choice here is to seek an internship / apprenticeship in some bakery. There are of course many hurdles in the way of doing so. Laws in the United Arab Emirates, specifically those pertaining to labor and food safety, are quite strict and will not allow for internships at food producing factories / outlets, unless you seek a job placement. Due to financial commitments, I can’t quit my current job to work for a bakery / patisserie / hotel / café.. and expect to be paid even remotely similar to what I earn now. Additionally, there isn’t cottage food law here, so if you plan to bake and sell commercially, you’ll have to obtain a commercial trade license like other food businesses. I’m seeking a partner to share part of the expenses, and the passion; I’ve found one so far. I talked to a bakery owner who declined to offer an internship, but pointed me in the direction of another bakery owned by his niece in another city where the regulations are not as stringent. I paid a visit to the bakery, and noticed that although they produce some pastries (oriental and French), in addition to pita breads, their business model isn't what I’d aspire to. The question is, am I right in thinking that an internship /apprenticeship at a bakery is a prerequisite to starting a bakery business? I’m passionate enough about baking, especially Artisan bread, and I’m willing to do what it takes to make it happen. I’d be happy to know what you guys think, based on your experiences. Any ideas are welcome. My husband and his friends were having a peach sour beer tasting party and he asked me to bake something that could pair well with those beers. I considered baking something peachy, but peach season is not quite in full swing yet, so the ones available at the farmers' markets are still a bit too pricey and not quite at their best. I decided to bake him a chocolate sourdough bread. I used the formula found on the SFBI website, but I think there's a similar formula in "Advanced Bread and Pastry". It's a hybrid bread using both a levain and instant dry yeast which worked out well for me since my starter is acting lazy and won't raise bread sufficiently right now. 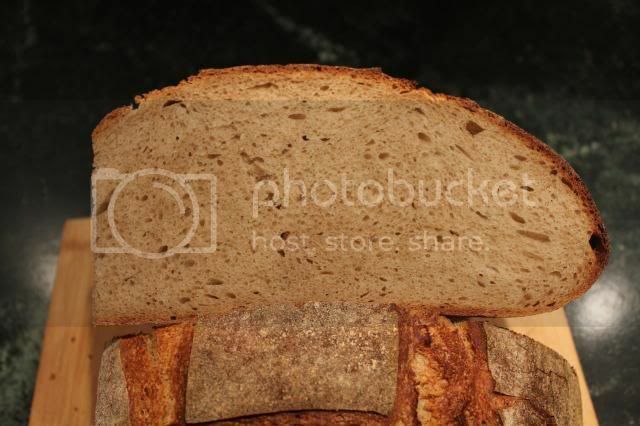 (See this thread about it: http://www.thefreshloaf.com/node/38563/not-enough-yeast-starter). The recipe called for chocolate chips, but I used chopped chocolate instead. 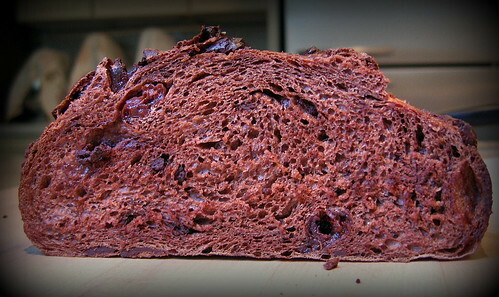 Chopped chocolate had the added benefit of staying soft even after the bread cooled off. It's easier to slice when a hard chocolate chip isn't tearing through the crumb. 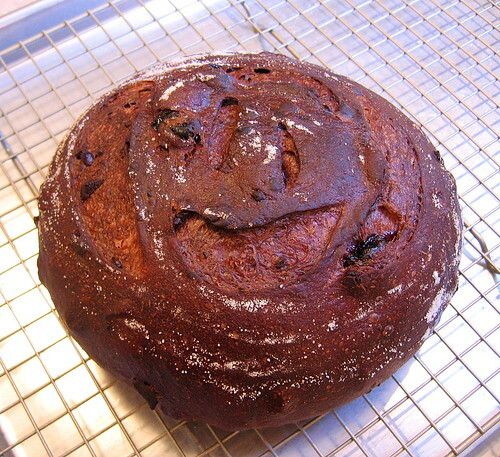 I added 27% dried sour cherries which along with the chocolate gave me an add-in percentage of 20%. The dough is low hydration (64%) so it's easy to handle. Others (elsewhere on the 'net, not on TFL) that have made this bread mentioned that it was not sweet at all. So I was taken by surprise that it was sweeter than I expected. Maybe other people expected something like a chocolate cake? Well, in that case I can understand the bread was not sweet when compared to cake. I expected less sweet and felt it was more sweet. It's all about expections. Perceived levels of sweetness aside, I would not call the bread overly sweet. The honey played very nicely with the Dutch-processed cocoa. I didn't detect any tang from the levain. Overall, the flavor of the bread was very well-rounded. The smokey bitterness of the cocoa and the bright tartness of the cherries paired perfectly with all those sour beers. Stick just-fed starter back into fridge to slow it down? I'm leaving town for a month -- was wondering if sticking my just-fed starter immediately back into the fridge without letting it start to bubble first might prevent it from getting to starvation point? On its last feeding it doubled in just under 2 hours.